Myth: The North Star is the brightest star in the sky. You’re lost. It’s night time. How do you find your way? You get your bearings by finding the Polaris, known as the North Star. Once you know where north is, you can determine which direction to go, in theory. However, if you’re basing your mental compass on the brightest star in the night sky, you’re likely not going in the right direction at all. Polaris is the only star in the night sky that appears stationary. While other stars change with the seasons and even as the night progresses, the North Star is always in the north. It is the last star in the handle of the Little Dipper. To find it, locate the Big Dipper. If you extend the line formed by the outermost two stars in the “cup,” it points to Polaris. Interestingly enough, the height of the North Star in the sky is equal to your exact latitude on the Earth. 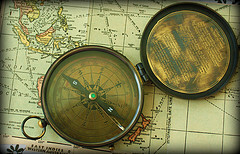 Myth: Magnetic compasses always point north. There are two situations in which a magnetic compass may not be pointing to true north. Learning about these limitations will enable you to adjust your calculations and find north. Interference: Since a compass depends on a magnetic element for accuracy, other outside magnetic fields or metals will alter the results and askew the compass arrow. If you place your compass and map on the hood of your car and try to calculate your direction, you’re liable to be wrong. The metal in your hood will affect the compass reading. Try to place your map on a wooden surface or simply on the ground. Even nearby metal trash cans or metal picnic table legs may alter the results. Declination: The magnetic north-south line which comprises the Earth’s naturally-occurring magnetic field is actually about 1,000 miles from the North Pole. While this may not make a difference if you’re hiking in Tennessee, it will matter if you’re in the Tongass National Forest in Alaska. Make sure that your map indicates the declination adjustment so you can accurately find your way. If you take these two limitations into consideration, your compass will always be right. People base this assumption on the fact that moss prefers shady, damp areas, and the southern side of trees tends to get more direct sunlight, supposedly stunting the grow of the plant. But when you take into account that many forests are thick, offering little direct sunlight, and even in an open area rocks and hills can cast shadows and block out sunlight. In reality, moss has an equal opportunity to grow on the southern side of a tree. Or on the eastern or western side. This navigation method is just not certain enough to trust, especially when other methods are more telling.